The transit agency announced plans to add new technology to its track inspection process, in addition to boosting other review timetables and safety protocols for rescue workers. 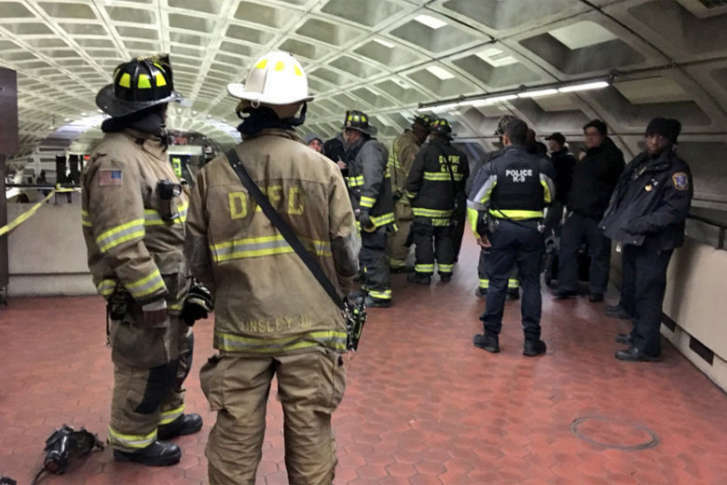 WASHINGTON — January’s Red Line derailment was due to a rusted rail that eventually cracked under the weight of a train, a final Metro investigation has confirmed. Metro said the crack could not have been detected before the Jan. 15 derailment, but the agency is again making changes to track inspection protocols. Metro plans to increase its use of technology and not just depend on walking track inspections. High-resolution cameras and ultrasonic testing tools will help scan ties and test for rail base corrosion. The technology-based testing is meant to complement existing walking track inspections, documents prepared for the Metro Board said. Tie scanning and rail base corrosion testing are scheduled this spring for the first time since 2015. Metro expects to do the tests every 2–4 years. For the high-resolution camera inspections, Metro is considering whether to buy its own equipment or hire a contractor. Metro is also increasing the frequency of ultrasonic rail testing using its track geometry vehicle from twice a year to three times a year starting in July. It takes about four weeks to do the testing across the entire system, so Metro is considering separating the ultrasonic testing from the track geometry vehicle. The vehicle’s main job is to check that the tracks and related infrastructure are spaced correctly across the system. A change could boost testing of the track layouts and ultrasonic testing to four times a year. Currently, some of Metro’s ultrasonic testing is done by the track vehicle, and some is done by contractors. The rail base between Farragut North and Metro Center corroded before the derailment on Martin Luther King Jr. Day. In the days after the accident, Metro was criticized for keeping the third rail electrified for more than 20 minutes after the derailment, and for keeping passengers in the train and inside the tunnel for nearly two hours. In the future, Metro confirmed Monday, it will now immediately cut power and evacuate riders who face a similar situation. During the derailment, radio communications problems hampered Metro’s response and significantly delayed the evacuation. Firefighter radios did work, however, and Metro said there have been improvements made to help first responders. The Federal Transit Administration and National Transportation Safety Board made a series of recommendations, and consequently, Metro added simpler track and tunnel directional signs that will be easier for rescue workers to follow. Metro is testing a number of markings on platforms to indicate where the doors will open, and where the flattest entry to a railcar will be. The door location signs are meant to speed up the boarding process and limit trips and falls. However, Metro has not yet found a preferred durable marking system for outdoor stations. After more Metro workers were shocked last year by the electrified third rail, Metro is expanding the circumstances where workers on the tracks are told to completely cut power. Metro is also emphasizing the use of new insulated mats to cover the third rail when workers are in the area, just in case power comes back on. The mats were rolled out in late 2017. In addition, Metro is continuing long-running work to upgrade a worker-protection guide that flags the most dangerous parts of the rail system. That’s where workers need to be extra cautious while on the tracks. Work to completely update the guide with detailed system maps and specific step-by-step instructions for each work location continues. Metro’s safety department has created a new team to focus on worker safety compliance. A second new team aims to deal with other workplace hazards, including how to protect workers’ hearing. That mandate came from the Federal Transit Administration. Separately, Metro is testing a new type of hard hat that could help prevent or reduce the severity of concussions if someone slips and falls or has something dropped on them from above. The helmets have a chin strap like a bike helmet, which should help it stay on if someone tumbles.